The staff at Elite Care Emergency Room in League City is always fast-acting, but on this day, their rapid response and quick decision-making earned high praise. 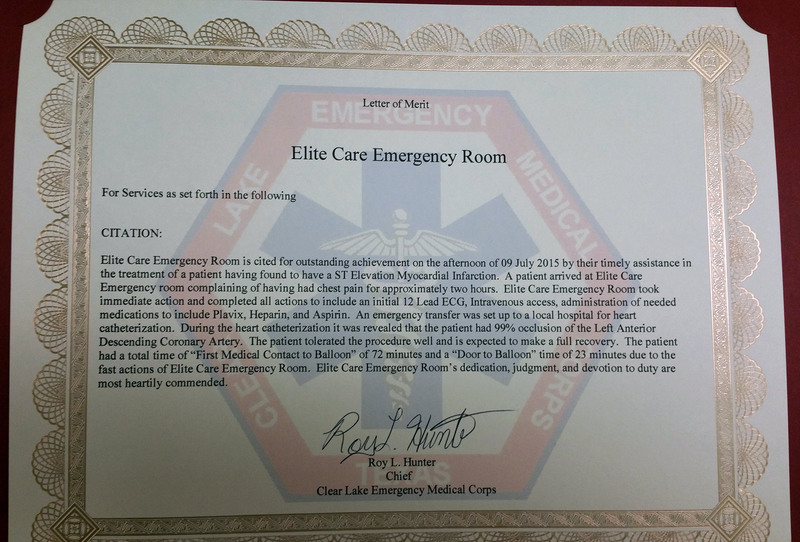 Elite Care has received a Letter of Merit from the Clear Lake Emergency Medical Corps for outstanding achievement in the treatment of a patient who arrived at the League City emergency room on the afternoon of July 9. The patient arrived complaining of having had chest pain for about two hours. Elite Care’s staff took immediate action: an initial 12 Lead ECG, intravenous access, and administering medications like Plavix, Heparin, and Aspirin, then set up a an emergency transfer to a local hospital for heart catheterization. During the heart catheterization, it was revealed the patient had 99 percent occlusion of the left anterior descending coronary artery, but the patient tolerated the procedure well and is expected to make a full recovery. The patient’s total of time of “First Medical Contact to Balloon” was 72 minutes, and the time of “Door to Balloon” was 23 minutes due to the quick response from Elite Care. The Clear Lake Emergency Medical Corps, which provides 911 EMS response for a number of communities in the Houston area, commended Elite Care for its dedication, judgment, and devotion to duty.